The state Labor MP John Newman was shot in the driveway of his Cabramatta home in 1994. Ngo, a former Fairfield City councillor and Mekong Club honorary president, was alleged to have wanted to take Newman's seat in Parliament. 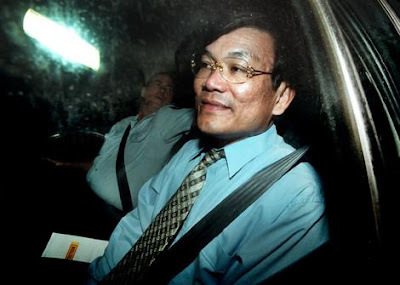 In 2001 after his third trial - his first was aborted and the second had a hung jury - Ngo was found guilty of organising Newman's murder. However, his two co-accused, David Dinh, who was accused of pulling the trigger, and Quang Dao, the alleged driver of the getaway car, were acquitted. Now there is new evidence which claims raises doubt about the validity of Ngo's conviction. The alleged murder weapon, a .32 calibre Beretta, was found in the Georges River almost four years after the murder. The gun was so corroded that Australian ballistics experts had been unable to conclude that it was the murder weapon. But a German ballistics expert gave evidence that the pistol recovered from the river was "highly likely" to be the one used in the killing. One of Australia's foremost corrosion experts, Dr Ian MacLeod, has said that the gun in the river could not have been the murder weapon because the degree of corrosion indicated it had been in the river for much longer than the estimated time. Their are challenges to the phone records that police used to connect Ngo to the weapon in the river. Ngo's mobile phone records placed him near the spot the gun was found within half an hour after the MP's murder. New research, has discovered "grey areas" near phone towers which cast doubt about crucial evidence linking Ngo with the murder weapon. In his first interview since his acquittal, Quang Dao maintains Ngo's innocence. "I know for sure that Phuong is not involved in that murder," says Dao, the alleged getaway driver, because he - Dao - was in the Mekong Club's white Camry picking up his children at the time Ngo was alleged to have been in the same Camry outside Newman's house at the time of the murder. Another witness - whose evidence was crucial in securing Ngo's conviction - had his own murder charge dropped in return for giving evidence against Ngo. Ngo's appeals, including to the High Court, have been unsuccessful and he is serving his life sentence at the most secure jail in the country, Supermax at Goulburn. After seven day's deliberating at the end of Ngo's second trial in 2000, which ended in a hung jury, the jury informed Justice James Wood there was no prospect of reaching a verdict. Much later, the juror, who had refused to budge while the rest of the jury wanted to convict, posted the following comment on his website: "To be fair to me, the Crown should now tell the country, and the world, one positive thing about me - that I foiled a plan to put an innocent man in jail for the rest of his life." In 1994 Phuong Ngo was wrongfully convicted of the murder of John Newman: yet another innocent man framed by N.S.W. police with the connivance of the N.S.W. government and its judiciary. Mr Ngo remains in gaol: in fact he is in the HRMU (High Risk Management Unit) in Goulburn, with a lot of other political prisoners of N.S.W. Why are they in a 'high risk management' unit when they are model prisoners? Ask Mr Iemma, maybe he knows. There is no exit strategy for these prisoners, living in solitary, airless, sunless conditions not unlike Guantanamo Bay; no hope for them to be transferred to a lower security gaol in the future. Most people I have spoken to, when shown the evidence for the acquittal of Phuong Ngo, firmly hold the belief that he was framed. Mr Ngo does not have a colourful past or troubled youth. Mr Ngo is an intelligent, articulate gentleman, a former leader of his community and a sincere member of his local Vietnamese Catholic church. September 1994 John Newman MP shot dead at his Cabramatta home. March 1998 Phuong Ngo, Quang Dao and Tuan Van Tran arrested during the coroner's inquest into John Newman's death. 1999 First trial - aborted due to prosecution misconduct. 2000 Alleged shooter David Dinh is arrested after Tuan Van Tran turns crown witness and is indemnified. Second trial (Phuong and Quang) - jury can't agree. June 2001 Third trial - Quang and David acquitted, Phuong convicted. Mark Tedeschi QC, the Crown Prosecutor, is an expert at what he does. Mr Tedeschi always presents the police evidence to the jury very convincingly. It is not for Mr Tedeschi to decide that the police evidence has been manufactured. It is his job simply to present to the jury what he has. This having been said, it was Mark Tedeschi who prosecuted the alleged Hilton Bombers, including Tim Anderson, who fully supports Mr Ngo in his efforts to prove his innocence. In 1984, Mr Tedeschi was criticized by then Chief Justice Murray Gleeson when he overturned the verdict against Tim Anderson. Murray Gleeson stated that Mr Tedeschi had misrepresented the evidence to the jury, contributing to the miscarriage of justice. Tim Anderson, Ross Dunn and Paul Alister lost seven years of their lives due to a police conspiracy. You would think a man as intelligent as Mark Tedeschi could see through these conspiracies and take a moral stand against them. But no, he just does his job as required. What a great public servant, and so typical of their attitude - ask no questions, see no evil, hear no evil. Phuong Ngo's supporters are numerous. They point to his genuineness as a community activist who has earned respect over a large number of years and freely gave of his time to help others. *The alleged killers were not convicted. Mr Ngo is not alleged to have fired the gun. *Another man, "Mr A", confessed on tape - but the jury was not allowed to know this. *The motive was disproved: The prosecution claimed Mr Ngo wanted Mr Newman's seat in Parliament. But at the trial it was established Mr Ngo was lined up for a seat in the Upper House. John Della Bosca was supporting Mr Ngo for an Upper House seat. *Three people were originally charged: only Mr Ngo was convicted. *The media generated racial prejudice, using such phrases as "Asian crime boss", "Cabramatta Overlord", "Ethnic gang connections". As an abrasive and arrogant local member, John Newman had many enemies in the area. Of all people, why would a gentle and educated man such as Phuong Ngo be the culprit? Phuong Ngo is clearly a political prisoner of New South Wales. He's the fall guy. Phuong was convicted on circumstantial evidence given by witnesses with every reason to lie. Mark Tedeschi excused one witnesse's blatant lies by claiming he wasn't very intelligent. Mr Ngo's recent letter to me was beautifully handwritten and articulate as always; thinking of others rather than himself; it hurts me so much that this good man is not only behind bars, but in the most evil prison in the country, the Goulburn HRMU, a place of torture, claustrophobia, airlessness and hopelessness. The innocent in the HRMU comfort each other on the rare occasions they are able to speak. They try to maintain hope while their lives slip away. In agreement with Tim Anderson and the Vietnamese community in Cabramatta I call on the Attorney General to set up an inquiry into the police investigation of the John Newman murder, the conduct of the prosecutor and the issuing of indemnities to witnesses. This state is so rotten with corruption it defies belief.